Born in Georgia in 1798, Mirabeau B. Lamar excelled in his youth as a horseman, writer of verse, and painter in oils. He came to Texas in 1835. After a quick trip back to Georgia to settle his affairs, he returned to Texas in the midst of the revolution and enlisted as a private in the Texas army. He served with distinction and in the span of a few short months, rose in the ranks from private to major general. 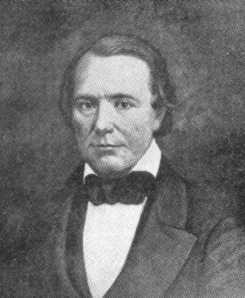 After Texas independence, Lamar was elected vice-president, in Houston's administration, of the Republic of Texas. He then ran and became the second president of the republic. Lamar served as a lieutenant colonel in the Mexican-American War and fought in the Battle of Monterrey. He then returned to Texas and represented Nueces and San Patricio counties in the second state legislature. Lamar died of a heart attack on 9 December 1859 on his plantation near Richmond.